RoboReview’s report includes predictive analytics to inform strategy and set expectations. TurboPatent, a company that develops applications to automate and streamline the patent protection process, is today introducing two artificial intelligence products for patent lawyers, RoboReview, a cloud-based product that analyzes draft patent applications, and RapidResponse, a product that assists lawyers in writing responses to office actions. 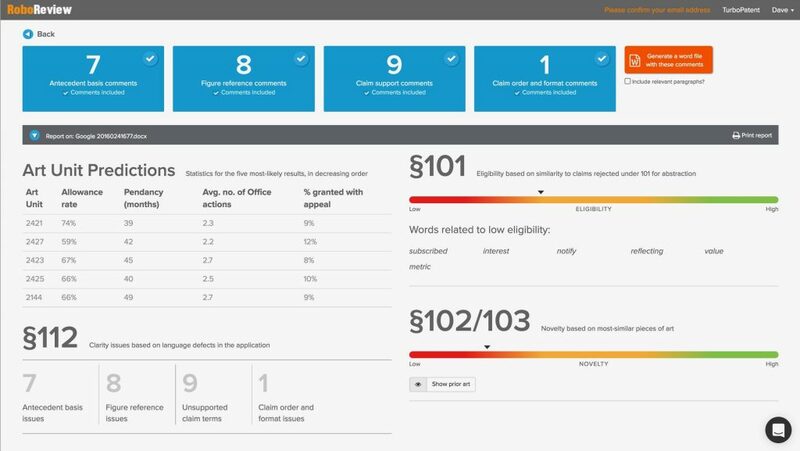 These follow the company’s launch earlier this year of SmartShell, an AI-powered tool that helps prepare responses to office actions, which I wrote about in February. 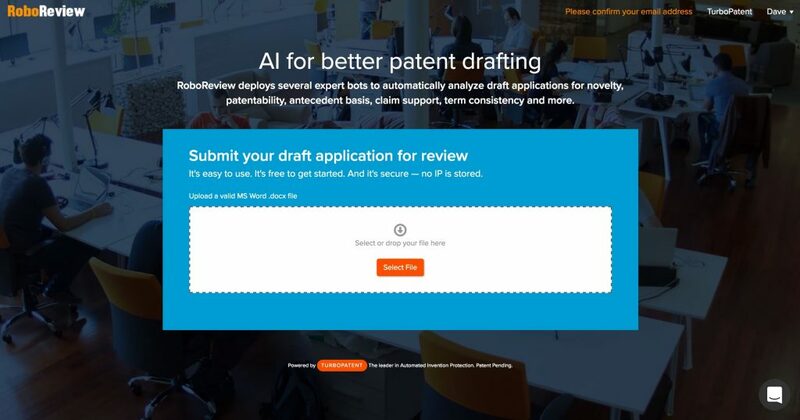 RoboReview uses AI and predictive analytics to automatically analyze draft patent applications for novelty, patentability, antecedent basis, claim support, term consistency and more. Its developers say that it dramatically reduces the amount of time it takes for lawyers to review a patent application and eliminates human error. Last week, I received a demonstration of TurboPatent by James Billmaier, the company’s CEO, and Charles Mirho, a longtime patent attorney who is the company’s founder and chief legal counsel. Mirho said that RoboReview substitutes for human review within a law firm of patent application drafts, performing a review that is on par with the analysis of an experienced patent attorney but in far shorter time and much lower cost. Drag and drop the draft application to generate a report. Predictive analytics to inform strategy and set expectations. These include predictions for the most-likely art units, patent eligibility and patent novelty. 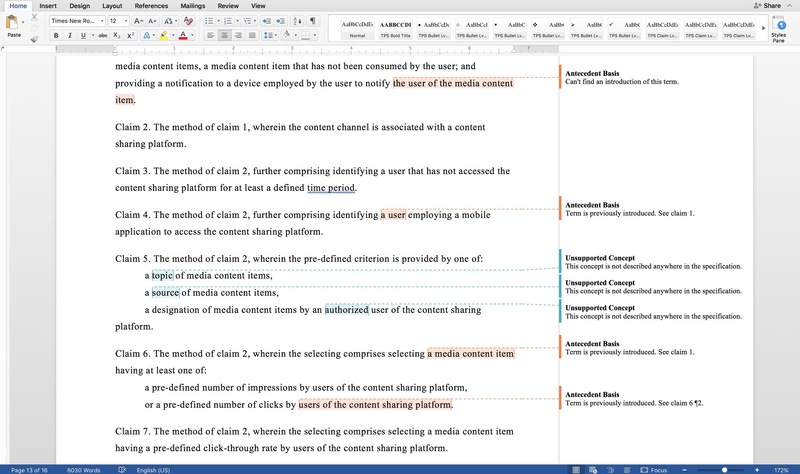 Automatic application review, which provides review comments in the familiar format of Microsoft Word. 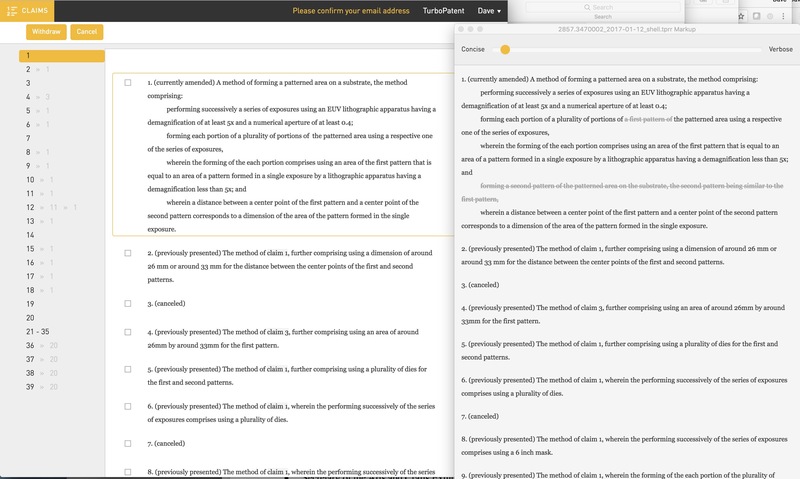 RoboReview provides comments in a form that is similar to Word’s “track changes” feature. Also today, TurboPatent is introducing RapidResponse. This is the next step to the SmartShell application I wrote about in February. SmartShell automates the creation of shells — documents typically prepared by paralegals that outline the issues requiring response after receiving an office action from a patent examiner. RapidResponse starts from the shell and assists the attorney in writing a response to an office action. Automatically calculate and present claim status indicators in real time. Auto-generate textual summary of claim amendments. Auto-format amended claims with USPTO compliant markup. Present live preview of markup while editing. Automatically number, order and adjust for dependencies. Detect claims with a canceled parent. Export claims to Microsoft Word format with markup and status indicators shown or hidden. Import clean claims with status. Import currently amended claims with markup.Predictive analytics to inform strategy and set expectations. Rapid Response can integrate with RoboReview. A future version will include all the capabilities now available in RoboReview. Rapid Response is available for free as an added feature to TurboPatent SmartShell which simplifies responding to patent examiners by automating the creation of an Office action shell. RoboReview is available as a monthly subscription with unlimited use or on a per use basis.